Louisville orthopedic surgeon Dr. Stacie Grossfeld provides college students who are interested in pre medical and surgical training the chance to participate in pre med internships. Recently Dr. Grossfeld partnered with Centre College in Danville, Kentucky, to offer Centre students the opportunity to participate in pre med internships during school breaks. 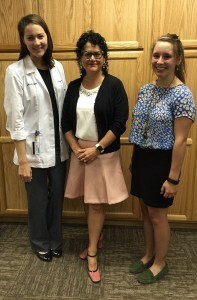 Centre College student Mackenzie Weiland is spending time working with Dr. Stacie Grossfeld at Orthopaedic Specialists this summer in the pre med student internship program. Mackenzie is a member of the Centre College division III women’s swim team. Her interest in athletics goes far back. In high school she was a junior elite triathlete, and she was also a competitive Irish dancer at the national level for 8 years. Mackenzie attended Oldham County High School, and graduated in 2014 with valedictorian honors. As a student at Centre College, Mackenzie is pursuing a major in Behavior Neuroscience (BNS) with a possible double minor in French and biology. During her free time she loves to travel, write, cook and spend time with her family and two dogs. She has always been interested in the medical field, and has shadowed in the Women’s Center at Baptist Health Northeast and at Oldham County Pediatrics. She was a also a student volunteer at Baptist Health East in Louisville in the Phase II Recovery unit. She enjoyed serving as president of the Medical Explorers program at Baptist Health Northeast during the 2013-2014 school year. During her pre med student internship at Orthopaedic Specialists, Mackenzie hopes to figure out whether or not she would like to pursue a career in medicine. 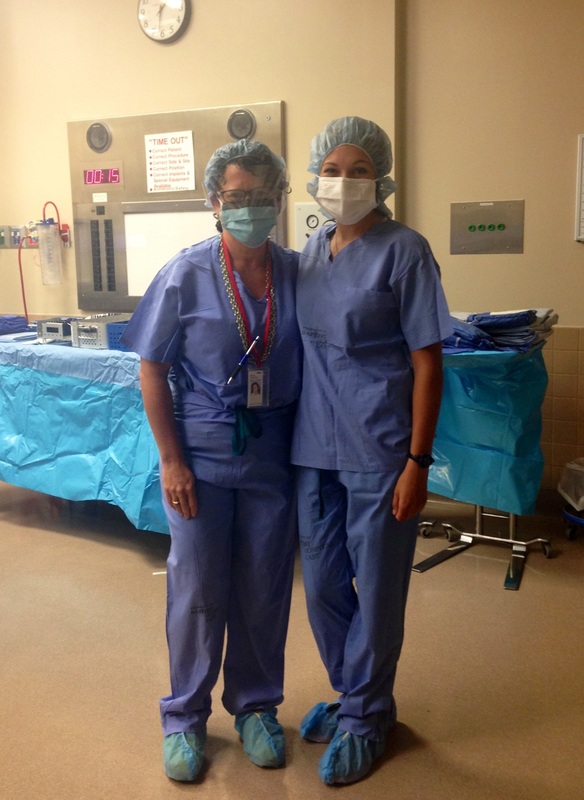 To read more about Mackenzie’s summer at Louisville Orthopaedic Specialists, click here. This photo is of Dr. Grossfeld with Mackenzie Weiland (on right) and Erica Toivenen (on left). Erica (Dr. Toivonen) is a Medical Resident spending time working at Orthopaedic Specialists. During the summer of 2013 Dr. Grossfeld enjoyed working closely with two Centre students. One of the students, Erica Ribenboim, Centre College Class of 2016, spent about five weeks working with Dr. Grossfeld at Orthopaedic Specialists in Louisville, Kentucky. 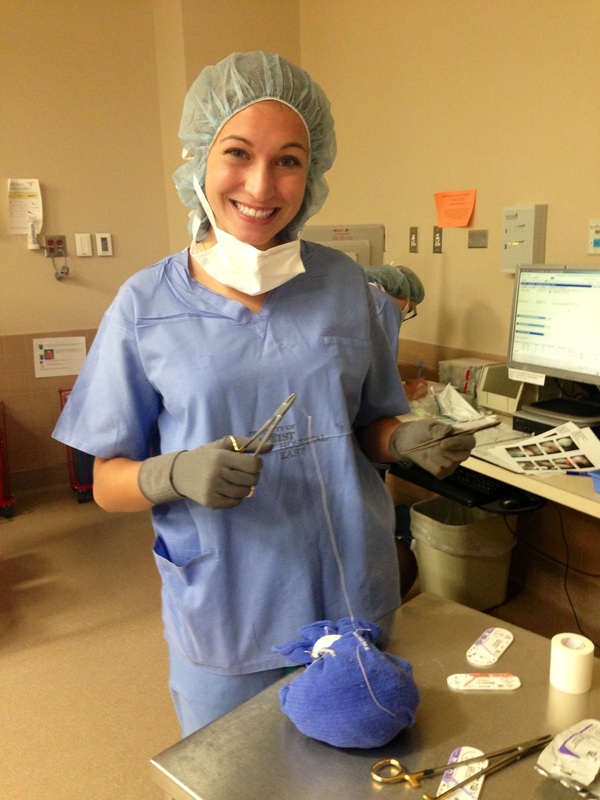 While interning at Orthopaedic Specialists, Erica had the chance to learn about and observe many different types of orthopedic surgeries and medical procedures including rotator cuff repairs, hip fracture surgery, ACL reconstructions and knee scopes. 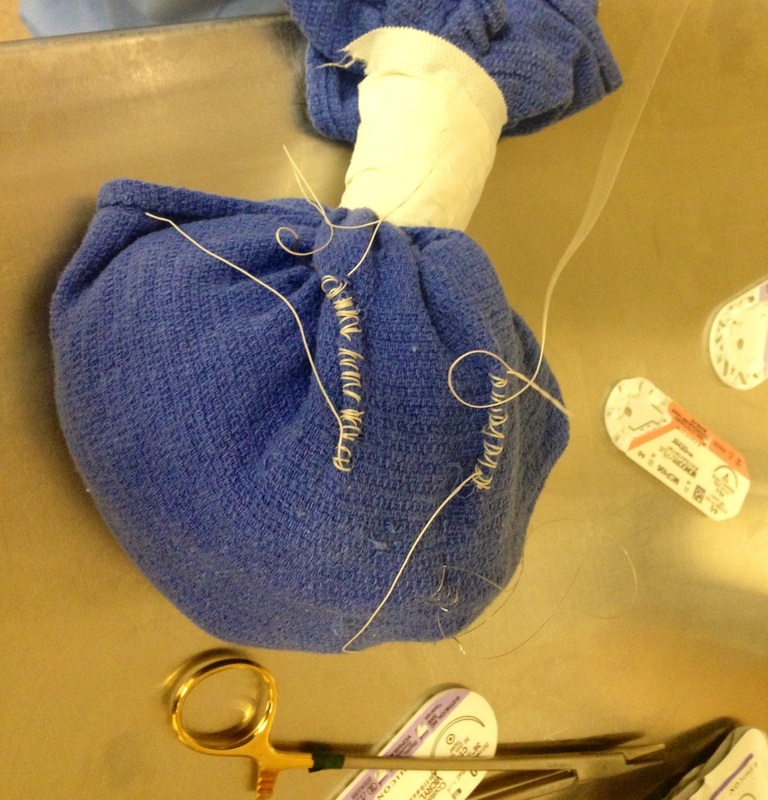 Dr. Grossfeld taught Erica a lot about the medical field during her pre med internship, including how to sew her first sutures. Erica also learned about how medical clinics work while spending time at Orthopaedic Specialists. 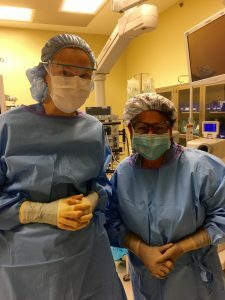 “Shadowing with Dr. Grossfeld gave me the opportunity to see a variety of different surgeries and allowed me to learn so much about not only orthopedic surgery, but about the medical field in general. 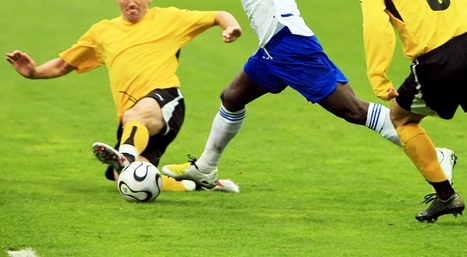 I was able to observe a wide range of orthopedic surgeries, including ACL reconstructions, knee scopes, rotator cuff repairs, hip fracture surgery, and the repair of a torn labrum. Dr. Grossfeld explained each surgery as I watched and always answered any questions I may have had. Not only did I get the chance to observe, but she also taught me how to sew sutures–which isn’t as easy as they make it look! In her office, I learned about the process of diagnosing patients and how clinics are run. Whenever there was a free moment, she talked to me about what it’s really like to work in medicine, something not all doctors are willing to talk about but something pre-med students need to hear. 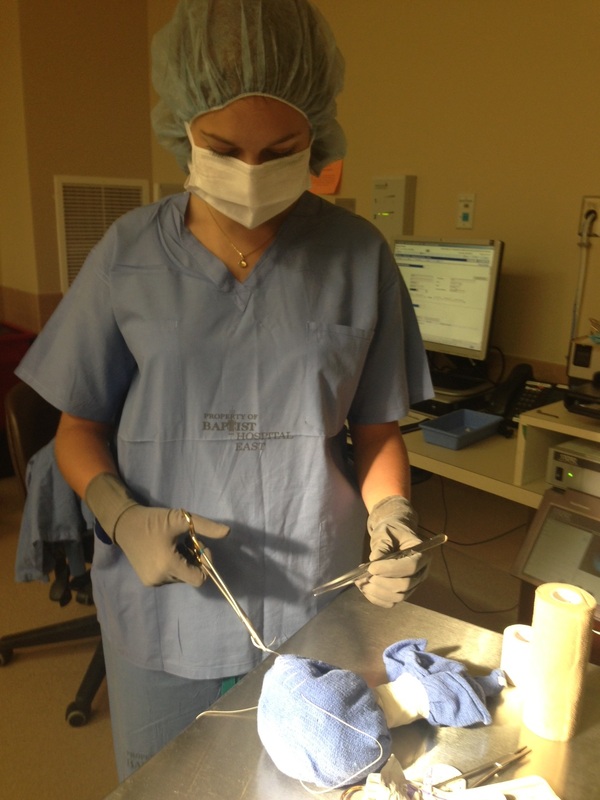 Here are some photos of Erica Ribenboim, Centre College Class of 2016, at Orthopaedic Specialists. A hot topic in ACL research involves which is a more superior operation: double bundle ACL reconstructions versus the single bundle ACL. In the April 2014 Journal of Bone and Joint Surgery Drs. Starman et al. reported on this topic in the "What's New in Sports Medicine" section of the journal. They stated that there is no current evidence to support one procedure over the other. I am a classical ballet dancer with the Louisville Ballet. I appreciate Dr. Grossfeld as an orthopaedic because she makes best efforts to understand the mastery and consequence of dancing eight hours a day. Dr. Grossfeld has comprehensive resources for treatment and understands the importance of rehabilitation. But most importantly, she makes sure I can do what I love...Dance.